As many of the articles in this series have suggested, having some emergency strategies in place, knowing your priorities when faced with a survival situation, having an emergency survival kit and brushing up on your survival skills, will enable you to prepare yourself as best you can. You’re rarely going to be forewarned that you are going to be faced with a survival situation. They tend to arise suddenly and you’re unlikely to know what form they will take, so take first aid supplies and items which can come in useful during a survival. Time is of the essence when it comes to search and rescue and the length of time it takes to find you can mean the difference between life and death. By leaving a detailed description with a person back home of the location you are heading, any planned route you intend taking and the time you expect to be back, can help them initiate a search and rescue operation, if you fail to return home by the specified time and can help the rescue team locate your position more accurately. When faced with survival, remember your priorities in order – shelter, fire, water, food, first aid, signalling. Finding shelter should always be your number one priority. As for the rest, water might sometimes be put before fire if you’re in a hot, humid climate where keeping warm might not be your first priority and first-aid may follow shelter if the injuries or illness experienced by you or one of your party members are more serious. It’s no use taking a first aid and emergency survival kit along if you don’t know how to use them. Enrol on a first aid course and prepare yourself for the possibility of how you’d cope with a survival situation by completing a basic outdoor adventure course in wilderness survival. It may not replicate an emergency situation but it will teach you new skills and improve your coping mechanisms. Make sure you know the best ways of locating and collecting water and, more importantly, how to ensure it’s fit to drink. Likewise with food, make sure you know what you can and can’t eat and if in doubt about a particular food; don’t eat it. You could end up becoming seriously ill if you eat or drink from a poisonous or contaminated source. Being creative and imaginative about items you can use and coming up with makeshift but adequate solutions to help you in a survival situation will increase your chances of getting out alive. Learn to adapt to your environment and look for things within it that could be useful for shelter, fire making, signalling and for food and drink. 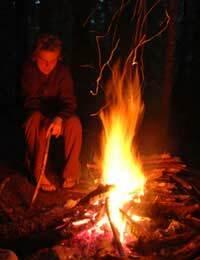 Learn how to keep warm in your shelter and how to make the most efficient use of your clothes and your fire making materials. Be wary of doing too much. Physical exertions will increase your need for fluids so keep an eye out on that and, if water is in short supply, keep physical activity to a minimum. Be very realistic about your predicament. A survival situation can cause panic and people will often go to desperate measures to try to get out alive, even though their actions might be more damaging than a solution to a problem. Know your limitations. It’s easy to suffer with a whole range of negative emotions if you are faced with a survival situation. Emotions such as fear, despair, confusion, anger and hopelessness can cause us to behave irrationally and to make bad decisions. Try to focus your negative energy and use it to fight back and to give you the will to survive. Keeping your objectives and thoughts of survival very much to the forefront of your mind will help you act rationally, improve your morale and make correct choices. Understand the importance of waiting for search and rescue teams to find you and make plans to signal for help. It’s crucial to be patient here and not to make a rash decision to attempt to walk out of the situation. Many people have died as a result of walking out of a particular survival environment only to find that they’ve then had to face even harsher conditions without the right equipment or the hope of being found. Once you have been located, understand the importance of taking on board the instructions from your rescuers. Many people have died in the final stages of a survival situation because they have failed to heed instructions correctly. In following these tips, you’ll be much better equipped to deal with any survival situation you might come up against.